Gesto means gesture, it is well used on their menus as they state “Un gesto di cui andare fieri”, more or less meaning “something to be proud of”. They then explain the meaning of the statement, asking you to not waste food and always bring the leftovers home, if you wish. A nice touch. It is a fine Italian tapas bar, little portions, good quality wine and food for both aperitivo and dinner. It is the ideal spot for many occasions as they create diverse moods at their many tables around the place. Some of them have tall stools where I might just seat down for a quick cocktail, others are comfortable sofas placed in intimate corners. Food is ordered via blackboards where you are asked to write down with different colored chalk. Every friend who’s been there has told me the same thing, I’ll sum it up for you: service is great, fast and friendly, food is good and since they serve tapas-like portions you get to try many different things; the mood is cool and the price is lower than you would expect; definitely a spot worth spotting. One more piece of advice, if you plan on going there on Friday or Saturday, give them a holler, reserve a table, or you might have to wait a bit. 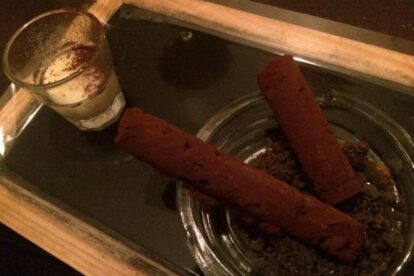 My favourite dessert is Sigaro del gesto, chocolate made cigars; a funny dish presentation paired with a delicious taste!